Two million people would not gather in five cities over three weeks if they didn’t have something to say. Yesterday’s Republican rally in the western city of Izmir was perhaps the most impressive meeting of them all. 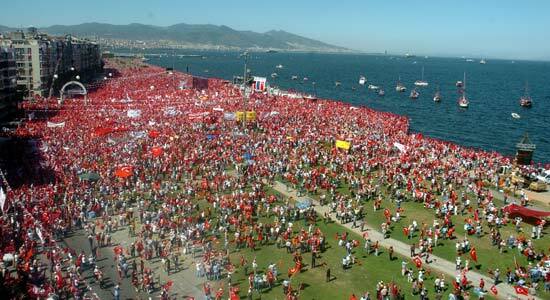 Nearly a million people attended, forming the stunning sight of a sea of red Turkish flags contrasting with the brilliant blue of the Izmir bay. “Turkey is secular, and shall remain so” has been the predominant chant at this and at previous rallies in Çanakkale, Manisa, Istanbul and the capital Ankara – all western cities. The protestors feel that with the recent presidential election Recep Tayyip Erdoğan’s ruling AK party has taken one threatening step too many towards dismantling Atatürk’s legacy. The intention is, they claim, to end the secular republic. That would be a very difficult thing to do. The Kemalist legacy is embedded in Turkey’s institutions: not a week goes by before children are reminded of it at school, and imams are instructed to preach it at Friday prayers across the country. You can’t overturn that in a hurry. One thing to consider would be whether AK really does want to end secularism. A recent Economist article would argue that evidence, so far, is to the contrary. The economy is riding high, the judiciary has been reformed, and ties with Europe are stronger than ever before. If AK truly is planning to instil sharia law the moment it takes the presidency, it’s doing a very good job hiding it. The Turkish people are better off than they were five years ago. Broadly speaking, they are happier, richer, and more likely to be in work than in 2002. Broadly speaking, this is down to the politicians in AK, who recognised what was needed and delivered it. Broadly speaking, they deserve to win the next election. And win it they probably will, because Turkey is a country of such size and diversity that even two million is not an electoral liability. Notice, for instance, that the Republican rallies have all been in western cities (with the exception of an upcoming event in Samsun, on the eastern Black Sea coast). For all the millions who took to the streets, there are millions more who did not. That is how some AK leaders have been consoling themselves over the past few weeks. They are wrong, and Mr Erdoğan should move to correct his party’s position. He was wrong to treat the presidential election as if it were an internal primary. He should not have waited until the last minute, when tensions were at their peak, before consulting the opposition. Now, more than ever, Turkey needs a compromise candidate for president, and only Mr Erdoğan can start the process to find one. If there is to be a public vote for president on July 22nd, he must propose and nominate Hikmet Çetin. AK cannot afford to ignore the secularist protests. That will only make things more difficult for them when they do return to government in July – especially if they need to seek a coalition partner.